In just six weeks time I will not only be dropping Roo of at school but also Tigger (sob). Whilst he has attended pre-school making the leap to full-time school seems such a big step. Tigger of course is ready for the additional challenge of learning, I’m just not sure that I’m ready for him to leave me all day! When Roo started school I bought far too much uniform for her, she had at least five of everything thinking that she would need a complete change top to toe every day plus at least an extra just in case. The reality was that I only needed clean polo shirts every day, a couple of skirts/pinafores and jumpers to change throughout the week. Now when we head out to buy school uniform I take a checklist with me with details of how many of each item I need to buy. Marks and Spencers have great checklists for those unsure on what their son or daughter will require (and hopefully stop you over buying). Whilst the idea of taking the children shopping for school uniform might not be high on your list of things you want to do, believe me when I say it is a lot easier to do sooner rather than later. Many stores have uniform available all year round however there is a larger selection available throughout July and August. Opting to go before the school holidays or at the start of the holidays will mean there is a great selection of sizes for your children to try on and purchase. This is something that every parent and even the school will tell you but ensure that you have labelled everything! My advice would be to label in at least two areas on each item and as labels can easily be removed investing in a name stamp this will not only make your labelling easier (unless your school insists upon sewn in labels – in which case I suggest you rope in Nanny to help) but will last wash after wash too. For shoes as well as labelling with your child’s name it can be difficult for little ones to get shoes on the right feet so cut a large sticker in half and place in each shoe so when it matches up they have got them the right way round. Whilst school uniform is there to ensure that the children all look the same (plus they do look so cute in their uniforms), children shouldn’t lose their sense of individuality so let them select what school bag or lunch bag that they will be taking to school with them. Encourage your children over the summer to place coats and shoes back where they belong in the home. When Roo and Tigger come home from school (and what was pre-school) they know that they need to place their coats, shoes and school bags back in the cupboard before they can do anything else. This not only helps me but aids them at school as they know that their school kit all needs to be kept together. 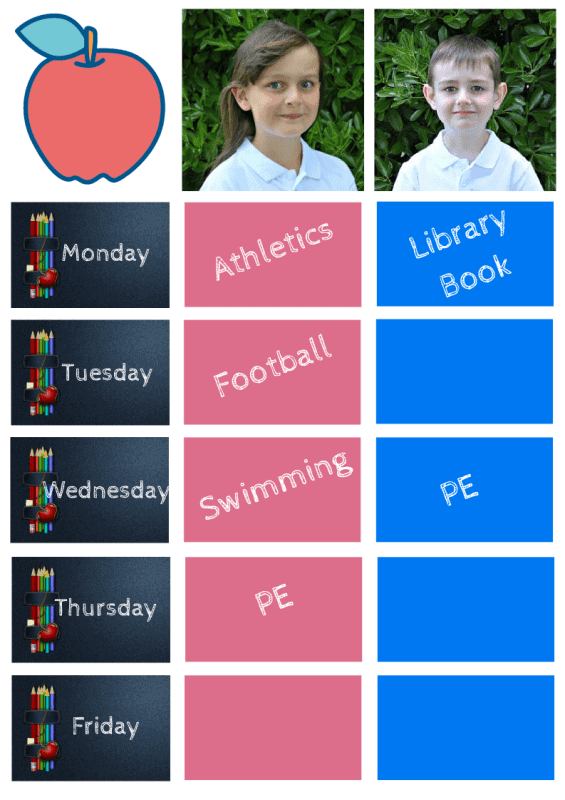 One last tip for when they are back at school and you know what day their library book has to be returned, their PE kit is needed and any after school activities are being held is to make a little calendar that you can laminate and pin-up above where they keep their school bag. It helps as a guide so that they (and you) can remember what they need to take in on what day. 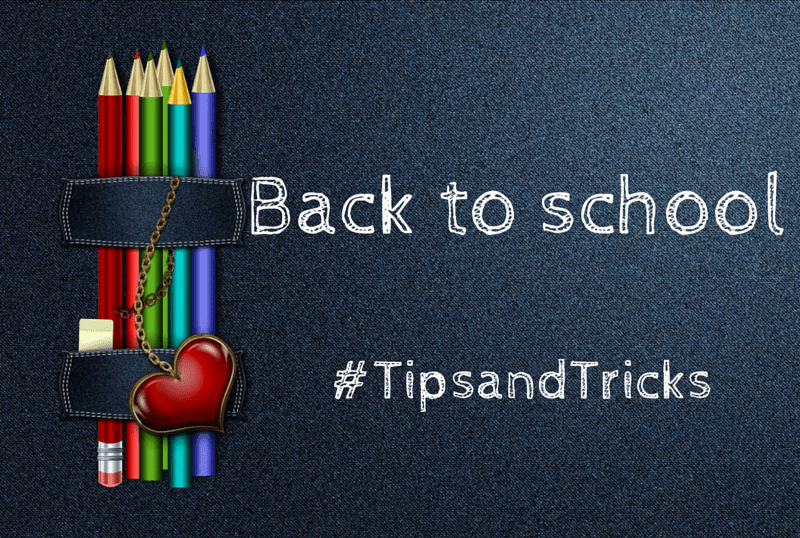 What are your #tipsandtricks for back to school? I’m sure this will be useful to many. I stick the older two’s timetable on my fridge so I know what lesssons they have each day. Great tips, I am usually very disorganised so this year I’m going to try and change that!